50% Contraction in the Fed’s Balance Sheet This is a great article on the Federal Reserve and it’s actions regarding interest rates and Treasuries. It’s a bit of a tough read, but if you can get through it and understand it, I think you will gain tremendous understanding of our current economic regulatory motivations and hurdles. Handicapping QE3 This one has an in depth look at the results of the previous rounds of Quantitative Easing, and the likely timing and effects of a third round. For more economic insight, check out the full list of Weekly Market Comments here. 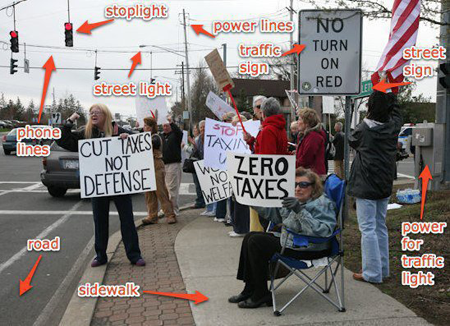 Those of you with facebook accounts have no doubt seen one or the other, possibly even both, of the above and below images (the one below had the caption Dare to be Stupid, Click LIKE & SHARE if people calling for “zero taxes” shouldn’t be using public streets and sidewalks . 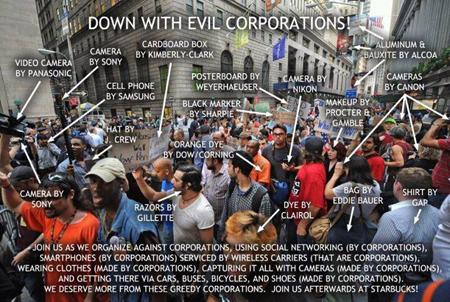 The former is an Occupy Wall Street protest. I think there is a bit of validity in the picture in the sense that while government has a monopoly on force, you are allowed to avoid using the products of corporations you don’t approve of in order to vote with your wallet to change their policy. Even so, the Occupy Wall Street message, while vague, seems to be one directed at general wealth disparity of management, rather than opposition to any given company or product. The latter is a Tea Party protest, with the implication that people shouldn’t be allowed to protest their government in public. These people paid for the things around them, regardless of whether they wanted to. While signs like “CUT TAXES NOT DEFENSE” are hard to defend in our current budget, the post is centered more on the validity of protesting, rather than the flawed message. 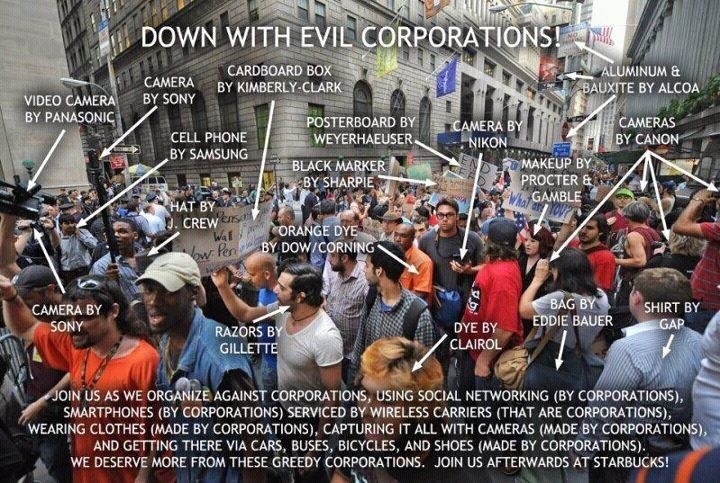 The first Amendment clearly gives them the right to assemble and redress their grievances, and unlike OWS, they are on public property rather than private. Both of these posts have tens of thousands of likes and shares. They are unhelpful. They lack substance. They serve only to increase partisan divides through snarky peer pressure. These two political movements should be embracing each other. They both find their main opposition not in each other, but in the status quo. Ron Paul recently made the point that compromise is when you give up half of your beliefs. He said we need to be finding common ground with others issue by issue, rather than picking one of the two parties and sticking with it blindly. What do they agree on? That those in power are abusing it, that there is too much money in politics, and that the system is broken beyond the point where working within the established system will fix it. They are both decentralized movements, which is both a strength and a weakness. Those in power (the combination of the two parties and their joint corporate masters) are ridiculing both sides on the airwaves. Photos like those above are shown as if they represent the views of the entire movement. On the other hand, without centralized structure, they are able to pull together a group of people who don’t agree on everything, without forcing any of them to compromise their beliefs. They are a hydra, much like many of the decentralized militant groups around the world. It’s hard to kill something that has no vital organs. And for each, the existence of the other alleviates that which has plagued every third party that has tried to spring up: the kingmaker excuses. If only one of these movements were to exist, the main party on the other side of the spectrum would get an easy win due to the split vote. If they are both strong, the two party system is out of excuses. Just an update on some recent Ron Paul videos. First up we have a couple from Jon Stewart, who has given a boost of cred to both Ron Paul and himself by highlighting the coporate media’s fear of everything Ron Paul. Stewart shows once again that he earned his place as the most trusted journalist in America. Sometimes all you need is an observant nature and an unwillingness to be bought. Stewart had him on again more recently. Below is the third part of the interview. The first two parts are there too, but were of less substance. Ron Paul needs to get better at explaining his positions to liberals. It isn’t that he wants to destroy all social programs and safety nets, he is just trying to get them back to a more local level. There was also this interview on FOX, where he talks about working with the Democrats, and how compromise in the modern political sense is where you give up half of your beliefs. He instead is willing wo choose his allies issue by issue, and find common ground rather than concessions.